Welcome to Oregon! We love this place and we’re happy you’re here to explore and enjoy a few of its wonderful places. When most people think of Oregon, they picture endless, evergreen forests punctuated with snowy, volcanic peaks. Even our auto license plate reinforces that impression. But the landscapes here are so much more than that. This is the loop we send our friends on when they have limited time but want to experience a really satisfying sampling of Oregon’s beautifully diverse and amazing landscapes. It will take you from cityscape, to mossy forests awash in waterfalls, to high alpine mountains, to high desert sage and canyon country, to rugged and wild coast. If time is limited, you’ll finish this loop and feel a sense of Oregon’s diversity – just be sure to take note of what you want to explore more deeply at a later date. And if you have the time to stay and savor the spots that resonate with you the most, that’s even better. Either way, we know you will want to come back for more. This loop takes you from the city of Portland, to the town of Hood River in the Columbia Gorge, and from there over the shoulder of Mount Hood to the central high-desert and alpine country of Bend, Oregon. From there, you’ll head west again, back over the Cascade Range to the Oregon Coast, and then up the coast and back to Portland. The entire loop is about 650 miles of driving. In each section below, we’ll give you the general driving directions in “The Drive.” And follow this with lists of things to choose from in the categories of “Play” (fun stuff to do), “Eat” (good things to fuel up on), and “Stay” (sweet spots to rest). Sometimes, we offer up Side Trips – highly recommended suggestions for those who have the time and curiosity to wander. Which leads us to the question of how long this trip takes. The answer? It depends on how much time you have. If you don’t take any side trips, this loop could be done in a week – but it would be a whirlwind tour. On the other hand, you could spend a week in any one of the four sections we’ve outlined, and still want more. Another option is to leave a section or two out, and spend less time on the road and more time on in-depth exploration of your chosen zones. It’s up to you! • Reserve ahead of time. If you know your schedule, definitely reserve your campsites ahead of time when and if possible. Summer is amazing in Oregon, and a lot of people know this. Campgrounds get full at this time of year, so planning ahead gives you some peace of mind. Although we’ve given you a general route here, it’s always a good idea to have reference maps, and a GPS (Google Maps or something similar) on your phone or pad in case you want to venture off the suggested road or need to re-route for reasons like weather or construction. We love the state-specific Oregon Road & Recreation Atlas published by Benchmark Maps. It has detailed maps and recreation guides for the entire state. And if hiking is your thing, Scott Cook’s guidebooks Bend Overall and Curious Gorge offer detailed (and irreverent) info, direx, and fun facts about all kinds of adventures you can have in two of the areas we’ll focus on in this loop: Central Oregon and the Columbia Gorge respectively. They’re available at Powell’s in Portland and almost every coffee shop in the town of Hood River. • Trail passes in Oregon. Many of the our favorite hiking and biking spots require the purchase of a day pass, but if you think you will be doing a lot of hiking and/or mountain biking on your trip, for a few bucks more, it might be worth buying the annual Northwest Forest Pass (fs.usda.gov). Once purchased, you can hang it from the rearview mirror and forget about having to buy a pass every time you’re at the trailhead. This is where you’ll start and end your journey. And since it’s the biggest city you’ll encounter on this loop, it’s a great place to stock up on whatever supplies you might need for your trip – edible or gear-wise. From the minute you arrive, you’ll feel its vibrantly industrious and creative energy. It’s a place that feels both familiar and cutting-edge at the same time, and it rewards curious exploration with a friendly vibe and surprising treasures at every turn. There’s a lot of fun inspiration to be found here, whatever you’re into: arts and crafts, great food, music, architecture, diverse culture, innovative city planning… It’s a place that exudes an open-minded willingness to try new things, and it somehow manages to have all the amenities of a big city while still feeling like a collection of neighborhoods – each with its own distinctive vibe. If you have the time, it’s worth spending a few days here to soak it all in. • There is so much to see in Portland, we can’t even begin to scratch the surface of all there is to do. Pick up a free copy of the local weekly paper – the Willamette Week – for current community events scheduled to take place while you’re in town (open studios, farmer’s markets, street performances, free music concerts – everything). • Here on a Saturday or a Wednesday? Don’t miss the incredible Portland Farmer’s Market at the intersection of SW Park Ave and SW Mongomery Street (near downtown Portland). There is a farmer’s market every day of the week in this city, but this is the one to see if you go to just one. • Sip a craft beer while watching a movie or some live music at the famous McMenamin’s Bagdad Theater & Pub (3702 SE Hawthorne Blvd.). • If you want to tap right into Portland’s thriving creative scene, wander the districts of Alberta Street and/or Mississippi Ave; these two neighborhoods are chock full of fun shops and eateries that reflect the thriving community of artists that live here. • Stretch your legs with a hike or trail run in lush, city-side Forest Park. Here, miles and miles of single track wend and wind through the woods; you’ll be amazed at how fast you’ll forget you’re in the middle of a big city. • Don’t miss Powell’s City of Books. Located downtown, this book lover’s paradise occupies an entire city block and is the largest bookstore in the world. Open 365 days a year, it’s located at 1005 W. Burnside (between 10th and 11th). • Experience the best of this city’s supreme food cart culture at our favorite cart pod located at SE 28th Place and Division. If it all looks good and you just can’t decide, send everyone in your crew to a different cart, then sit down and share it all, family style. Weekend evenings are particularly lively, with festive lights strung over picnic tables filled with families from the surrounding neighborhoods. • With its “we do it all by hand” vibe, turntable stereo sound system, and hand-thrown pottery place settings, Sweedeedee delivers a truly Portlandia experience. Open for breakfast and lunch, everything here is excellent – but try the house-smoked trout and salted honey pie for something you won’t find every day (5202 N. Albina Ave). • Indulge in a Reggie Deluxe biscuit sandwich (fried chicken, egg, bacon, gravy and cheese all piled atop a southern-style buttery biscuit) or opt for lighter but equally delicious fare at Pine State Biscuits (2204 NE Alberta Street). • Stock up on food supplies at the friendliest grocery store on the planet: New Season’s Market. It’s a local “chain” in Portland, so use your phone to find the one closest to you. 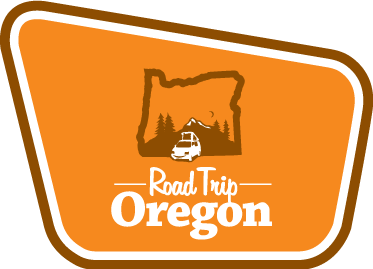 • If you want to get out of town right away, there are several campgrounds in the Columbia Gorge which will put you into the first leg of this loop trip. Oxbow park is a beautiful campground located on the banks of the Sandy River. 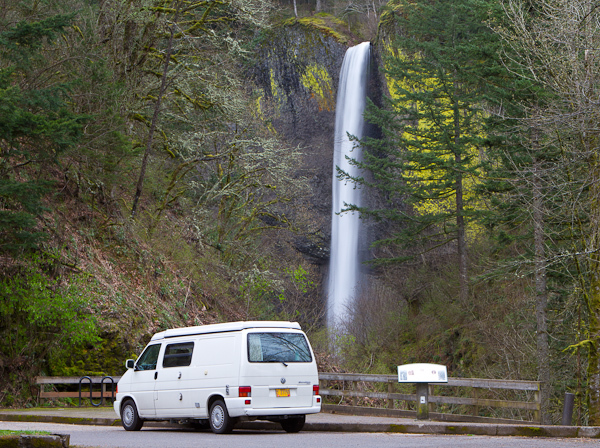 The Cascade Locks Marine Park Campground is also in this area of the gorge, and located near several hiking trailheads. Viento state park is located on the banks of the Columbia River and close to the town of Hood River. One of the best things about Portland is how quickly you can get out of the city and into wild country. Today, you’ll travel only 60 miles or so through the indescribably magnificent Columbia Gorge. The waterfalls will remind you of Hawaii, but the landscape is the pure and classic Pacific Northwest of your dreams – complete with big trees, snow-capped volcanoes, and dramatic waterways. You’re heading towards the little hamlet of Hood River, but before you get there, we recommend stopping for a hike en-route (see Side Trips suggestions below). From Portland, take Highway 84 east towards Hood River (signs will say The Dalles). Hood River has several exits (61, 62, and 63) but don’t miss the opportunity to stop for an unforgettable hike at one of the spots we’ve listed below on your way there. • The wildfires in the Columbia gorge in the fall of 2017 destroyed many of the trails to waterfalls on the Oregon side. Make sure to check current closures before planning your trip in the Gorge. There are lots of beautiful hikes and waterfalls to explore on the Washington side of the gorge that weren’t affected by the fire. We recommend climbing to the top of beacon rock for cliff top views of the gorge. To the east of Stevenson, WA on Hwy 14 we recommend the Wind mtn and Dog mtn hiking trails. • The impressive Falls creek falls drops 335 ft and is located about 20 min from Carson, Wa. • Hood River has a waterfront park/event site right on the river where you can rent various watercraft (stand-up paddleboards, kayaks, and kiteboards) and also get instruction if you need it. • White-water raft down the White Salmon River (you’ll take the Hood River Bridge to the Washington side of the Columbia for that). There are many outfitters to choose from; for guided rafting and kayaking, we like Wet Planet. • Ride a bike. There are tons of great roads and trails to ride in and around the Hood River area. To rent road or mountain bikes, or for ideas about where to ride to match your ability, head to Discovery Bikes in downtown Hood River. For the latest on trail conditions for mountain biking, go to: http://thegorgeismygym.com/mountain-biking/Mountain bike. • Savor the sourdough/bacon waffles for breakfast at River Daze Café (202 D Cascade Ave, mall 202, 2nd Street, Hood River). • Pick from the delectables at Boda’s Kitchen and build a picnic lunch for your adventure-packed day (404 Oak Street, Hood River). • If you’re craving Thai food, we love Lampoei’s Thai Kitchen, a cart set up in a parking lot shared with several shops off Highway 35. We highly recommend going there on Saturday because it’s the only day they serve their Saturday Soup, which you will dream about for the rest of your trip. When you’re done enjoying your meal, walk across the lot to Mothers Market to stock up on healthy food supplies. • Henni’s Kitchen has the best fish tacos east of Portland, incredible Indian curries, an addictive goat cheese/beet salad, and a burger that’s home-made through and through – even the bun and the ketchup are crafted in-house. You’ll cross the Hood River bridge ($1 toll each way) to dine here. It’s in the little town of White Salmon, at 120 East Jewett. • For your coffee fix, head to Doppio Coffee or Dog River Coffee. Both are on Oak Stret, the main drag in Hood River’s small “downtown,” and both are good spots to hang out if you need to hunker down for a session with your laptop – but they each have a different vibe – so decide which fits your mood best. • For laid-back fun and tasty pub fare, try Phriem Family Brewers on the scenic riverfront or Double Mountain Brewery in town. Double Mountain is also known for their excellent pizza. • There aren’t any developed campsites right in town, but just a few miles outside of town, you can snag a campsite by the river at Tucker Park (2440 Dee Highway, Hood River). If that’s full, try Toll Bridge County Park, a bit further South on 35; it has some pretty spots as well. • Hands down our favorite place to camp in the Hood River area is Lost Lake Resort. It possesses sweet versus snotty lake-side charm, with wonderful campsites and a can’t-be-beat location: lake-side with insane views of Mount Hood. A rustic general store rents various watercraft (no motor boats allowed), and summer water temps are perfect for wetsuit-less swimming. Even locals who live in Hood River plan weekends here – it’s that great. • Outside of Hood River, on the way up Highway 35, you can camp at Sherwood Campground, which is about three to four miles past the forest boundary and located on the East Fork of the Hood River. Added bonus: It’s close to the trailhead of one of our most-recommended hikes – Tamanawas Falls (which we recommend doing en-route to the High Desert, see below). Today you’ll drive from Hood River to Bend, a distance of about 145 miles, but with several “don’t miss” hiking options along the way (see “Side Trips” below). Take your choice – but we recommend doing both hikes, as they are very different and equally amazing. From Hood River, take the 35 over Mount Hood. (Note that if you’re hiking Tamanawas Falls, the trailhead is about 25 miles from Hood River up Highway 35). Merge onto US-26 E and stay on this for 62 miles. Continue onto US 97 S for 18 miles. At this point, you’ll hit the tiny town of Terrabonne, and if you want to hike or climb in the spectacular Smith Rocks State Park, you’ll turn left on B Ave and follow the signs to the park (see “Side Trips” below). After hiking, retrace your way back to Highway 97 to continue south to Bend (only about 30 minutes south). • Tamanawas Falls: There are two ways to access this waterfall hike – from Pollallie trailhead (north access) or from Tamanawas Falls (south access). Both trailheads are off of highway 35 on your way to Bend, but we recommend the south/Tamanawas Falls entry: it’s shorter yes, but you’ll skip the least scenic section that’s in view of the highway. Plus, it’s just ¼ mile north of Sherwood Campground, where you may have opted to spend the night. This hike is one where the journey is just as amazing as the destination – gorgeous every step of the way. You’ll cruise along a crystal clear creek shaded by ancient, old-growth cedar and fir trees to the ultimate destination: a stunning, 150-foot waterfall in a bowl canyon. Once there, you can opt to scramble up to the dry cavern behind the falls – which you have to experience to believe. People tend to miss a crucial trail turn on this one, so be sure to bring turn-by-turn trail directions with you. The Curious Gorge guidebook is good. • Smith Rocks Sate Park. Hike the Crooked River canyon or climb stunning rock formations – either way, this stop is not to be missed. One of Oregon’s most scenic and beloved spots, plan to explore this area on a weekday if possible, as weekends can be crowded. Check in at the yurt/ranger station for a trail map and other info on natural history and climbing. Keep an eye out for bald eagles and peregrine falcons, and note that certain areas of the park are seasonally closed to protect these raptors. • The Metolious River. Venture a bit more north to explore this serene and magical Shangri-La, where a clear, emerald-green river tumbles through old-growth ponderosa pines, larch, fir and cedar. The fly-fishing is beyond belief, and the camping, hiking, biking, and wildlife-viewing are world-class. A little research will leave you rewarded: this wonderland is a place that locals return to again and again – you just might find yourself doing the same. • Crater Lake National Park. From Bend, it’s an hour and a half south to this legendary destination, so it’s quite the side-trip, but we couldn’t leave it out as an option. There is simply nothing like it. At 1,943 feet deep, this incredibly blue lake is the deepest in the United States, and it lies in a volcanic crater surrounded by two-thousand-foot-high cliffs. Go. You won’t be sorry. • Run, hike, bike, paddle, fish or float along the rolling and ridiculously scenic Deschutes River Trail. Sublime sections of riverside trail can be accessed both in and out of the town of Bend, and there are sections of runnable (and unrunnable) whitewater. Book a rafting trip, or paddle calm, flat-water sections. Whether you’re exploring by water, foot or wheel, there are plenty of spots to tuck off the trail for a picnic and a dip. Stop in at Pine Mountain Sports for great topo maps of the area and to decide which section of the river you want to do and how you want to do it (Pine Mountain Sports, 255 SW Century Drive, Bend, Oregon). Or, Tumalo Creek & Kayak rents water rigs of all kinds and offers instruction if you need it. • With its hundreds of miles of world-class single track, Bend is heaven for mountain bikers, and has perfect terrain for every level of ability. Stop by Pine Mountain Sports to rent bikes and get maps and friendly, local knowledge about the best places to ride. Cog Wild, which shares the same building, can provide shuttle service and guides. • Pure and simple: Go hiking. There are endless trail miles to explore here: high in the mountains, along the rivers, and closer to town. Access depends on the time of year and the weather, so get a good guidebook, choose a hike that melds what you want in the day’s mission, and go explore. There is something for everyone – water, altitude, sagebrush, snow, solitude – you name it, you will find it. • Spork serves unique and delicious street food in a casually hip and festive space that feels like a mix of Burning Man, Bangkok, and the best taco stand you’ve ever found. Originally a cart, the demand was so high, they transitioned into the current brick-n-mortar establishment. Our hands-down favorite thing here? The catfish tacos. And if you’ve worked up a big appetite, go for the Lomo Saltado (937 Newport Ave, Bend). • Bethlyn’s Global Fusian Farm to Street food cart features a medley of amazing meals from around the world. Meats are sourced from humanely-raised, grass-fed animals, and she always has vegan and gluten-free options. You really can’t go wrong here, but the fried avocado black bean bowl is addictive, and the daily special consistently proves to be dazzling to the taste buds. The cart shares a driveway with the beauty shop at 1040 NW Galveston, but is kind of hidden around the corner. • If you’re looking for sit-down fancier fare with reasonable pricing, try Joolz, “where mezze meets the mesa” – a melding of Middle Eastern and Southwestern flavors. We recommend getting a mix of small plates so your can share and enjoy the variety of flavors. • In Oregon, free camping is allowed on public lands, though this fact is kept a little on the down-lo. Just beyond Bend’s city limits, you can camp in the National Forest between Forest Service Road 41 and Century Drive. However, be aware that you are NOT allowed to camp between the Deschutes River and F.S. Road 41. From Bend, drive the US-97/Bend Parkway North for a few miles (or less depending on where you are in Bend) before exiting to take the US-20 West for 22 miles to the town of Sisters. You can vortex out here for a day or two (see “Side Trips” below) or continue onwards to the coast. When you’re ready to head west, take the US-20 out of Sisters, and when the road forks, you’ll get on the OR-22 north then west to the city of Salem. This section has some insane viewpoints, and plenty to explore along the way, so stop and play if you can. From Salem, keep going west on OR-22 for 26 miles or so, then take the exit ramp that merges with OR-18 west. Take OR-18 west for about 26 miles to tiny Otis. Here, you’ll have to decide if you want to do the amazing Cascade Head hike (see “Side Trips” below) or continue north on the 101 to Pacific City and Cape Lookout State Park where there’s good camping. Or you could do both (which is what we recommend). • You will be going through the town of Sisters on your way from Bend to the coast, and if you didn’t get enough hiking, biking, and fly-fishing in Bend, there is a whole slew of that going on around here too (and sweet campgrounds both in and just outside of town). Or, just grab a delicious smoothie and a handcrafted baked goodie at legendary Angeline’s Bakery before heading onward. • Get the best introduction to Oregon Coast’s wild beauty imaginable by hiking Cascade Head as soon as you near the coast at Otis. The Salmon River merges with the ocean here, and once you start climbing out of the mossy forest start, the views are as stunning as those you’ll find in Big Sur, California. There’s a grassy headland, an old-growth forest with crazy twisted trees, chance of an encounter with an endangered species of butterfly, and some secret rewards we’ll let you discover on your own. Well worth the stop, trust us. • Explore Pacific City. Here, you can hike the glowing gold sand dunes of spectacular Cape Kiwanda at sunset, or surf the break inside the haystack monolith that sits offshore. Get cold-water wax for your board or rent one (and a wetsuit) at friendly, fully-outfitted Moment Surf Company . • Hike Cape Lookout. This narrow peninsula extends two miles out into the ocean, and on a clear day, in the spring and fall, it’s the ideal spot to look for migrating gray whales. The hike is an out and back that takes you along the length of the land spur, through massive spruce forests thick with mosses and ferns. Expect to get muddy if there’s been any rain, but don’t let that stop you: the hike is amazing and the hawk’s-eye views are so worth the fun scramble. • Surf, hike, or just take a rest day at one of the most protected and picturesque coves on the Oregon Coast: Short Sands Beach in Oswald West State Park. This place has it all: waterfalls, a few gurgling creeks, a sandy beach, surf, tide-pools, and old-growth forest – which is why you probably won’t be alone here – but don’t let that bother you. Pack your toys, lunch, water, and layers for the day because it’s an uphill haul to get back to the parking area if you forget something. • When the tide is low, you can explore the beach, caves, and tide pools of Hug Point. And during minus tides, you can walk the beach for many miles here – BUT! You MUST know what the tides are doing because you can get stranded or worse if the tide comes up. Most surf shops, hotels, and campgrounds have free tide books you can take with you, but you need to know how to read them… Ask someone if you have any doubts. • Ecola State Park, which covers nine miles of glorious coastline between the towns of Seaside and Cannon Beach, is a great place to spend a day. Surf at Indian’s Beach, or simply tidepool and picnic in its beautiful cove. There are also many miles of wonder-filled trails to discover here, some even traversed by Lewis and Clark’s team in 1806. The terrain is varied and dramatic, and as you wander, expect to encounter lush Sitka spruce forests, grassy bluffs with famous viewpoints, an abandoned lighthouse, and wildlife galore. Even the drive into this place is insane. • Explore the sweet little shops, galleries, and eateries of the town of Manzanita. Most of the gems are centered around the main street – Laneda Avenue . • Re-supply on healthy groceries at Mother Nature’s Natural Foods (298 Laneda Ave, Manzanita; 503-368-5316). And for more standard staples, shop The Little Apple, across the street; they have everything from gourmet items to comfort-food favorites. • For a perfect cup of coffee and some great atmosphere, check out the Sleepy Monk Coffee Roasters in Cannon Beach. They specialize in organic. • If you burned lots of calories surfing or hiking near Pacific City, refuel at Ben & Jeff’s Burgers and Tacos or the Grateful Bread Bakery. And if you just want something sweet, a dose of caffeine, and some time on wifi, Stimulus Café meets all these needs nicely. Their gluten-free marionberry pound cake is memorable. • We recommend staying at classic Nehalem Bay State Park and using it as your basecamp for exploring up and down the coast. It’s clean, family-friendly, has hot showers, and is within walking and biking distance to the cute town of Manzanita. A wide, long, and beautiful beach is just a hop over the sand dunes from camp. Make reservations because in summer, even these bigger state campgrounds can fill up. • If you’re going to do the Cape Lookout hike or surf in Pacific City, the best place to camp is Cape Lookout State Park. True to Oregon State Park style, it’s clean and well maintained, with spacious sites, immediate access to a great beach, and relative proximity to many of the area’s best hiking trails (including both the Cape Lookout and Cascade Head hikes mentioned in this blog).